The lambing finished and our five ewes produced two sets of triplets and three sets of twins, a total of 12 lambs! This is a better lambing percentage (an average of 2.4 lambs per ewe) than you could hope for even in a large flock; they have all done exceptionally well. We now have to brace ourselves for when the lambs go off into the organic food chain, and we must try once more ‘to go out of sheep’! 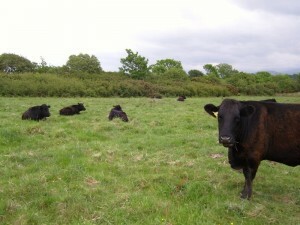 We took all the cattle to our fields at Ty’n y Coed. Since being there they have brought the wet, crubby and undergrazed pasture into much better shape, without harming its wildlife value. They have established their routine of moving between the fields, and hiding in the scrub while watching us top the thistles and admire the wildflowers. We managed to get some good quality haylage cut and baled while the weather held in June, but ended the month with three fields still to cut. We are in the same worrying situation which we have faced for the last two years. 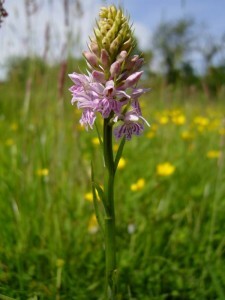 The big plus this year is that two of the hayfields are full of common spotted orchids; they are just the tip of the floristic and insect rich iceberg as the slow reversion of once fertilised and re-seeded pasture progresses. After two more trips away – to Barcelona and Poland – the vegetable garden has needed serious work. Somehow we found the time to clear and plant a good range of crops, from early potatoes and broad beans to onions and leeks, cabbages and parsnips, beetroot and fennel. They have all done well, in spite of the attentions of a rabbit! The strawberry bed has begun to give us another good crop, and blackcurrants and gooseberries will be ready in July. In the orchard the birds have had the cherries as usual, but the plums are looking very promising. Several practical projects have got under way including a replacement fence, clearing the silage pit for small hay bales, completion of the hard standing behind the new yard, the Soil Association annual inspection and wheeling out the newly refurbished hen house. With the ‘hungry gap’ nearing it’s end, it’s coming up harvest time, and the freezer will be full once more and the preserving pan fully occupied! This entry was posted on Thursday, July 16th, 2009 at 9:29 pm and is filed under Diary. You can follow any responses to this entry through the RSS 2.0 feed. Both comments and pings are currently closed.